Chocolate Chip Cupcakes w/ Cocoa & Tahini – These adorable little mini cupcakes are perfect for Valentine’s Day. 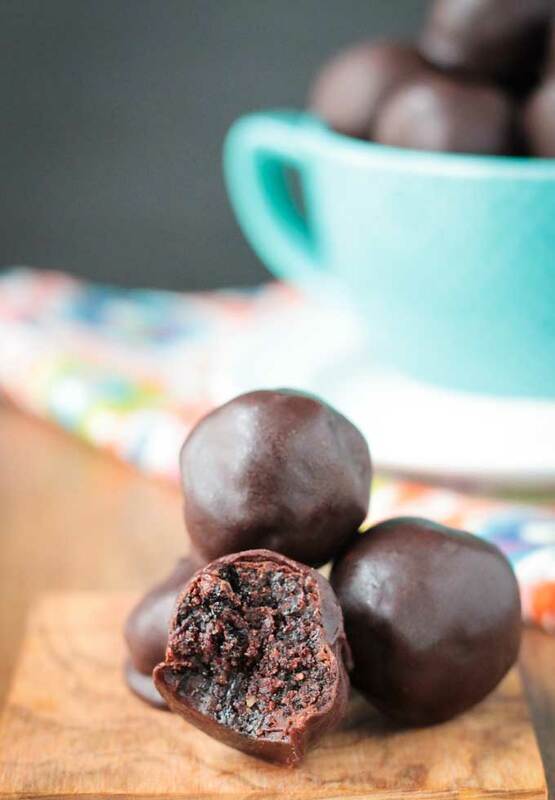 Treat your sweetie…or your kids…or yourself…to some chocolate indulgence made healthier with no dairy, no eggs, no oil, and no refined sugar. We’re only a week away from Valentine’s Day. While I’m not big on a showy celebration, I do enjoy eating sweets! It doesn’t have to be a holiday for me to indulge in some decadent chocolate, but it is probably the only time you’ll see me busting out the heart shaped cupcake pan. And who can resist little chocolate heart shaped cupcakes? Not my kids, that’s for sure. I lost count of how many they have eaten. Ok, I’ll admit, I lost count on how many I have eaten! And you will too! little bites of chocolate chips – heaven! I drizzled on some lightly hued pink icing, mostly for my girls’ benefit. I had a bottle of cran-apple juice in the fridge and used that instead of non-dairy milk to mix with the powdered sugar. You can use anything red – beet juice would make a gorgeous color. As much as we loved the addition of the icing, it’s absolutely not necessary. Check out the soft, fluffy texture of the inside of the cupcake above. These mini Tahini Chocolate Chip Cupcakes are so light and moist. No one will know these are dairy free, oil free, egg free, and refined sugar free! Bonus – they are nut free too, so feel free to pack one in your kids’ lunch to show them how much you love them! I hope you love these Tahini Chocolate Chip Cupcakes as much as we do. If you try them, please come back and leave me a comment below with your feedback and star rating. You can also find me on social media. Be sure to tag @veggie_inspired and #veggieinspired so I’m sure to see it! Chocolate Chip Cupcakes w/ Cocoa & Tahini - These adorable little mini cupcakes are perfect for Valentine's Day. Treat your sweetie...or your kids...or yourself...to some chocolate indulgence made healthier with no dairy, no eggs, no oil, and no refined sugar. 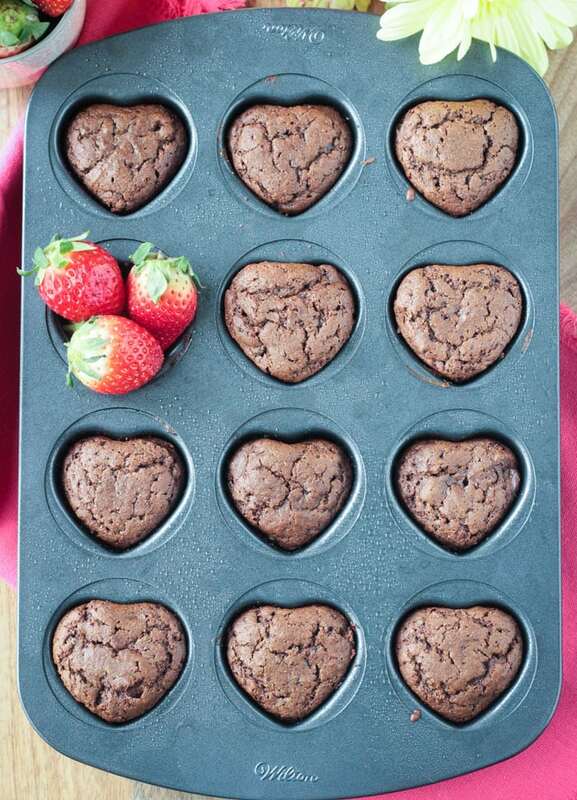 Lightly spray a 12-cavity heart shaped mini muffin pan* with cooking spray and set aside. In a small mixing bowl, whisk together the flour, cocoa powder, arrowroot powder, baking soda, salt, and sugar. In a medium mxing bowl, whisk together the tahini, vanilla, and non-dairy milk. Spoon the batter into the prepared pan, filling each cavity no more than half way. Bake 23-25 minutes, until a toothpick inserted in the center comes out clean. Cool in the pan on a wire rack for at least 20-30 minutes** before removing from the pan. Drizzle icing, if using, over the top of the cupcakes before serving. *If you don't have a heart shaped mini muffin pan, a regular mini muffin pan will work just fine, you just obviously won't have heart shaped cupcakes. Alternately, a regular size muffin pan may be used. Fill each cavity about 3/4 of the way full. Bake 25-28 minutes. You should get about 8 cupcakes. **These cupcakes are soft, fluffy and delicate. Make sure you let them cool in the pan before removing them or you may have cupcake crumbles instead. Do you mean to use 1 1/2 cups flour? The recipe calls for 1/2 c and that doesn’t seem like enough for all the cupcakes the recipe makes. No, the measurements are correct. The cocoa powder and arrowroot powder contribute to the dry ingredients too. And keep in mind, they are mini cupcakes (the recipe will make about 8 regular size cupcakes if you only have a regular muffin pan). Hope you like them! Let me know how they turn out! Thanks for your prompt reply. The heart shaped muffins are in the oven as i write! The batter was very thick so i added a bit more milk. I am thinking these will be delicious. I had tasters of the batter so know they will. Thanks for your amazing recipes. 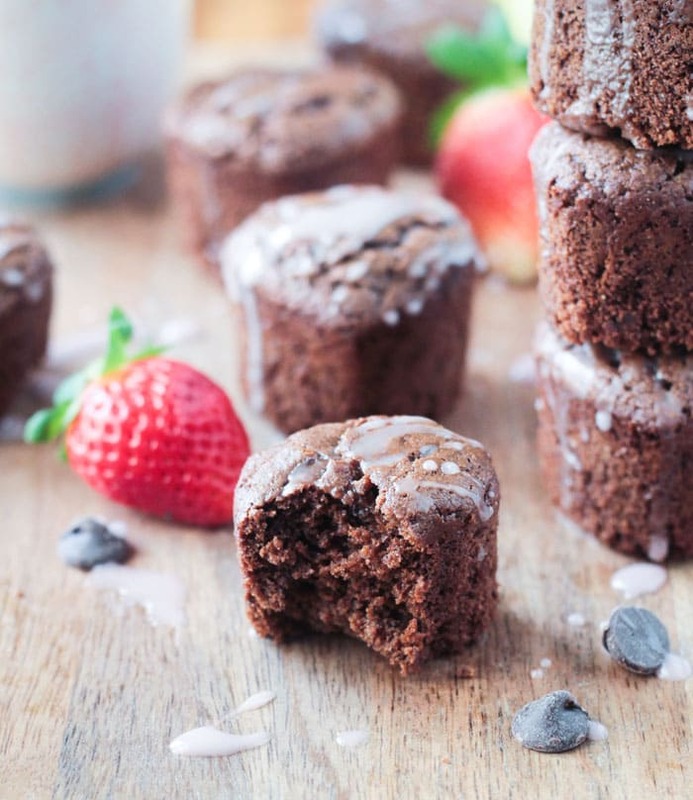 The best thing about plant based baking – licking the batter!! 🙂 Enjoy, Robin! Let me know how they turn out. I thought I wrote to tell you that I love the cupcakes and will definitely be making them again. Thank you, Robin! So happy you loved them! These are fantastic! The tahini / cacoa combination is divine. Usually I can see the calorie, fat, protien I could have missed it somewhere above however could you pls let me know. thanks for sharing! Thanks, Laura. Glad you like them. I don’t have the calorie counts on the blog because every program will give you slightly different results (though I have recently been looking into my options for getting them on here – so stay tuned). There are several free online sites you can plug in the info into (nutritiondata.com and myfitnesspal.com are examples). If you have one you trust, use that one. Tahini is one of those ingredients that approach cautiously, because I can’t stand the bitterness (yes, I’ve tried all of the “good” brands), but recipes like this make me think I just need to branch out in how I use it! Well, I think the sweetness of the cupcakes balances out the bitterness of the tahini really well. BUT, I DO really LOVE tahini, so take that into consideration. You could always add a bit more sugar for your tastes! Thanks, Alisa! 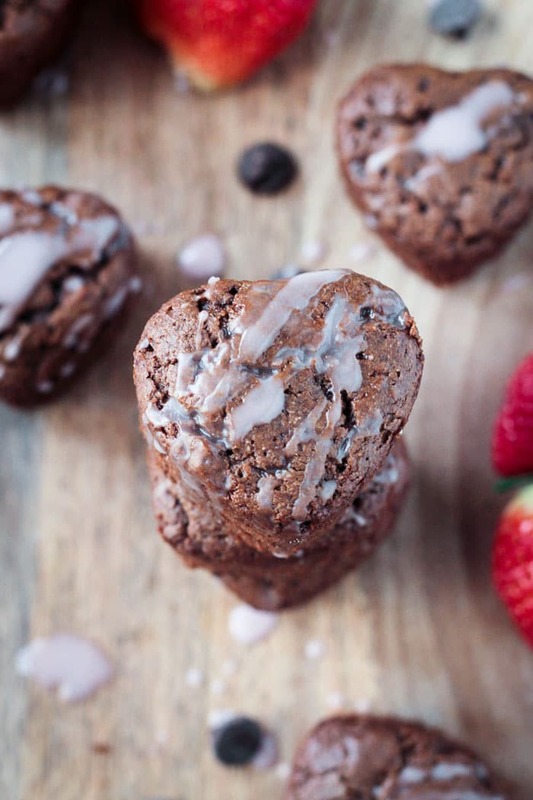 I love chocolate and tahini together and baked up into a heart shaped cupcake sounds perfect! 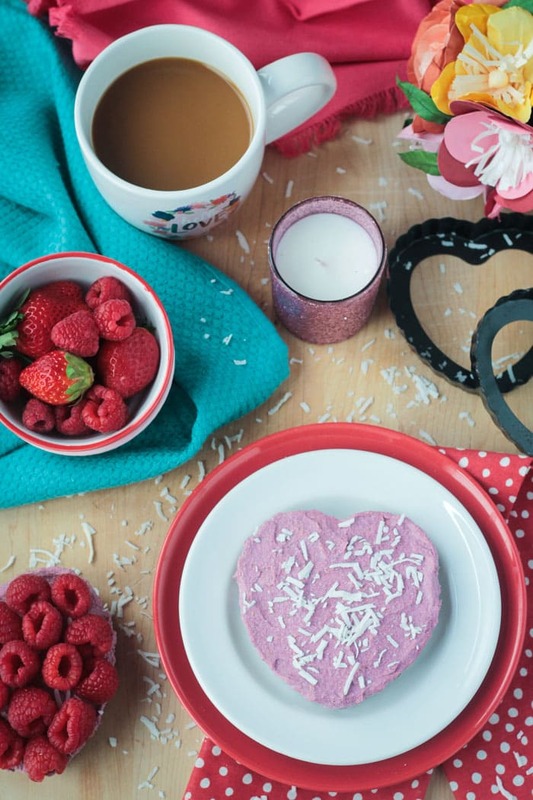 Thanks!The heart shaped pan makes it easy to turn everyday goodies into holiday treats! What a cute little heart shaped tin! So many things you can do. Love the brownies! I use tahini in mine too. Such great flavor. Ah, great minds think alike! I love the chocolate/tahini combo! Thanks, Sophia! Thank you, Sina! It’s a great combo! Happy Valentine’s Day! Chocolate and tahini are the best combination! These look delicious! Thank you, Sarah! I agree! Jenn, these are simply the cutest little cupcakes! Hi, Theresa. I have twins too – they just turned 5 last month. I’m so glad to hear you loved them. What kind of flour did you use? Fingers crossed all the little ones love them too! Thanks for stopping by to let me know! These look so good Jenn! I love chocolate and tahini together, it’s one of my favorite combos! I’ve been working on a dark chocolate tahini bread this month and then you post these and I’m like, droooool, lol! I love that you made them with a heart shape. 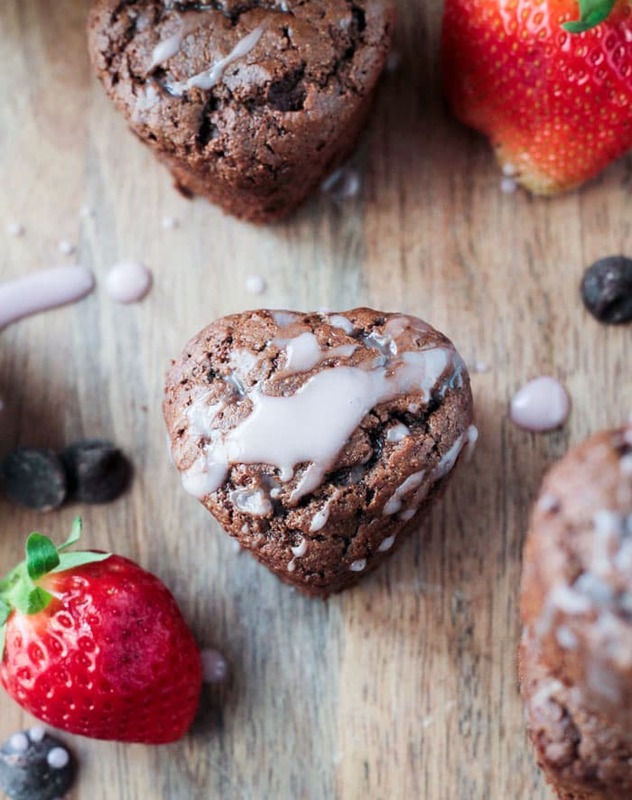 I have a wheat chocolate muffin recipe on my blog in the shape of hearts too, hahaha! Great minds think alike. I’m loving that you added a glaze on top, that definitely would not be optional for me, haha! Thanks, Brandi! I have dark chocolate tahini granola bars on the blog, too – I definitely love the combo! Looking forward to your bread recipe! Those are super cute and I love how you used tahini. Thanks, Nicole! I love chocolate and tahini together! I can’t wait to try this recipe, Jenn. These muffins sound fabulous! Haha, you’re welcome! It’s definitely a great combo! Thanks, Cadry! I love the heart shapes, just gorgeous. I’ve never baked with tahini before but it sounds like a great idea so I’ll have to try it. I’m also thinking these might be healthy enough to add to the children’s lunch boxes. I know they’d love them but I’m sure I’ll be eating a lot of them first. Hi, Edwina! You can use tahini like any nut butter and I just love the flavor it lends to chocolate. 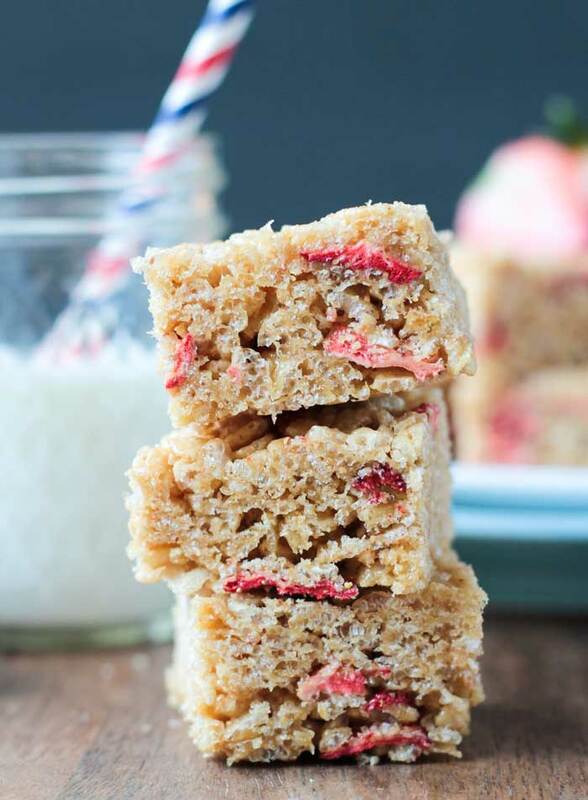 Perfect for the lunchbox as they are nut-free (if you use soy milk). Let me know if you make them! Pretty and good for you, what’s not to like? These sounds delicious, Jenn. I’ll have to make them for the hubby on V Day morning. Thanks, Linda! I hope you both love them! I’ve been eating cupcakes for breakfast for days. LOL! These sound amazing, I adore chocolate and tahini together! And how cute is that muffin tin?! It’s totally worth it to have a pan you only use once a year, right?! Ha!! Thanks, Starr! I love this heart shaped cupcakes, Jenn. They would be a great idea for Valentine”s Day! Thanks, Agness! Definitely a fun festive treat! OMG, that pan! 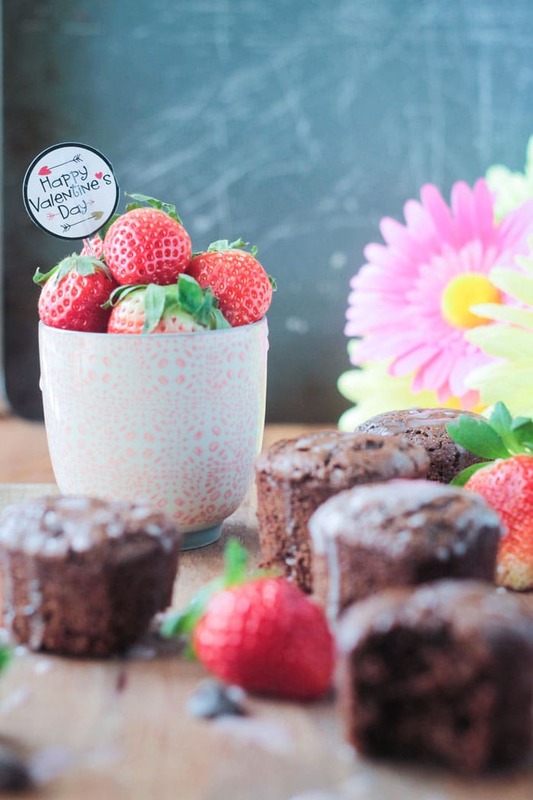 These are darling– and I absolutely love that photo with one cake removed and the strawberries in place. I’ve been having a love affair with tahini lately, so am definitely going to try these! Thank you so much, Michelle! I needed a little pop of color in that photo. 🙂 The pan is darling, isn’t it…even if I do only use it once a year. LOL! These look and sound absolutely delightful! I’m loving that they’re vegan and the addition of tahini is amazing! I love tahini and the heart shaped pan – so cute! Thanks, Lisa! I really love the tahini in this recipe too! Such a great balance of flavors! These are the cutest, that’s the kind of pan I wish I could just rent for 2 weeks a year 😀 I love the tahini addition too, so yummy with chocolate! HaHa, I know!Sometimes I just can’t resist the cuteness. This is only the second time I’ve used it (well, I made this recipe 3 times to get them perfect, but you know) ….and the first time was an utter failure. Must have been last year’s attempt at a Valentine’s Day recipe, but I can’t remember. LOL! These look so amazing! Darrol and I are on a baking kick right now. Maybe we’ll do these next! Perfect! My girls helped me make these! I let them pour everything in…except for the arrowroot because that stuff can get quite messy! 🙂 Hope you guys love them! These look amazing! I’ll have to make these for the hubs for Valentine’s Day! These are adorable! Not sure the icing would be optional for me. 😉 Linking through to those chocolate truffles too, they caught my eye. Thank you, Dreena! My girls would say the icing is not optional either. 🙂 It honestly doesn’t bring much as way of flavor or sweetness…unless you really drench them…but it does look pretty! 🙂 Enjoy the truffles too! This look so tasty, and they’re perfect for Valentine’s Day! I love that they’re made with tahini!